First came Ronaldo at the 2002 World Cup. Then, in 2008, it was Spain’s men’s basketball team, followed closely by the Spanish tennis team. 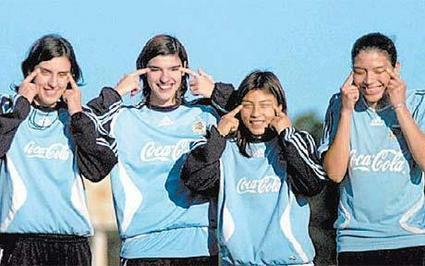 And now Argentina’s Olympic women’s footballers have been caught in the act. This photo was published – without controversy, we add – in the Argentine sports newspaper Ole on 5th August. What is it with Spanish-speaking Olympians and a heroic absence of political correctness? I accept that different nations have very different levels of tolerance when it comes to what is racist and what it not, but this is the 21st century – how dumb do you need to be not to think that making such a gesture is offensive? Olympic karma update: Argentina’s women lost 2-0 to China. In fact, they lost all three of their matches.